Interestingly, one of the places of worship. 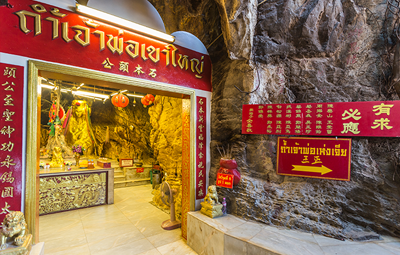 Situated on the way to pay homage to the foot print of Buddha which is situated on the mountain top. 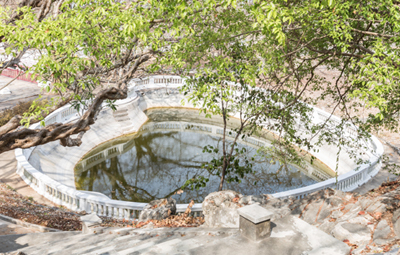 The marble used from this handsome fountain, located in Ruan Vadhana, was sourced from Italy at the request of King Rama V. The fountain was originally located in Tamarind Hill and was abandoned for many years. 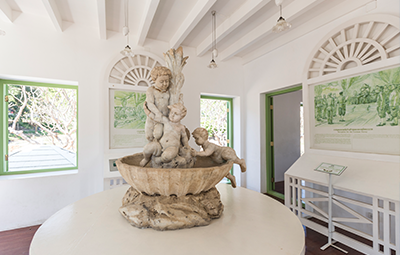 It was eventually found, restored and put on display within Ruan Vadhanna. 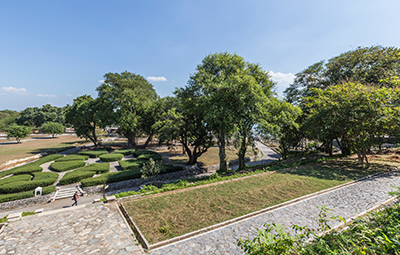 The remnants of King Rama V's summer palace. 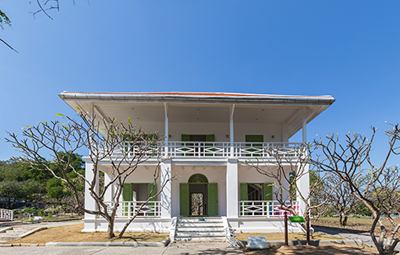 The main structure was moved to Bangkok in 1910, yet several Victorian-style structures and gardens remain. 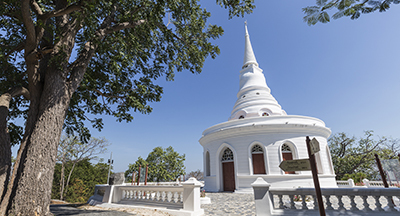 This unique temple features a mix of gothic and classical Thai architecture, and holds a small consecrated chamber that was the private meditation sanctuary of King Chulalongkorn. 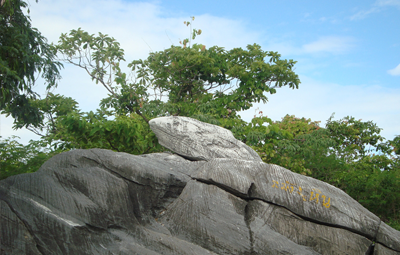 Located on the right hand side between the Palace and Wat Asdangkhanimtr, the Bell Stone is a natural rock formation in the shape of a frog. If you hit the Bell Stone with a rock it rings like a bell. 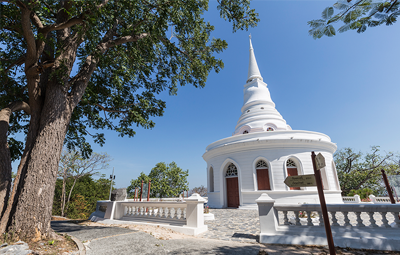 To the right of the Bell Stone is an old photogenic Chedi. 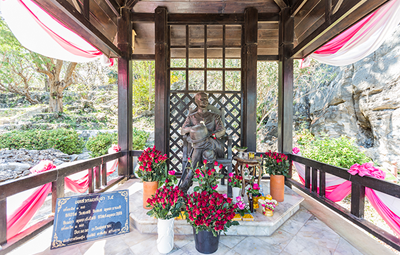 To commemorate the life and works of Kind Rama V, a shrine was built in his honour on the grounds of Phra Chudadhut Palace. 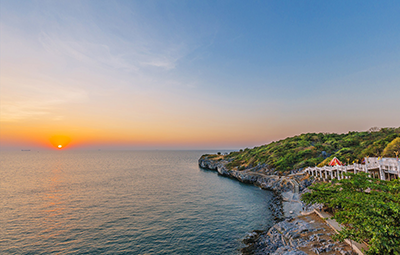 King Rama V built many public works projects on Koh Sichang, including bridges, schools, parks, the freshwater dock, the lighthouse and the main road that circles the island. 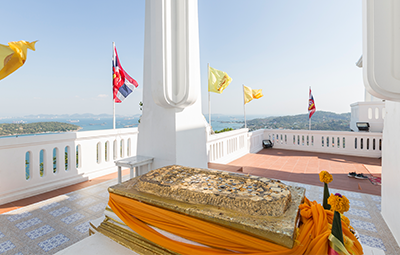 As a testament to his works, the people of Koh Sichang constructed a statue of the monarch and many people make offering to the shrine on a regular basis. 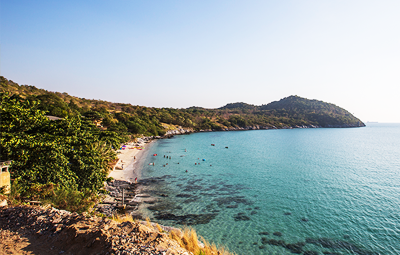 Long white beaches, tranquil stretches of water with small rocks beneath the surface, overlooking the beautiful clear sea. King Chulalongkorn used his personal funds to build this bridge to celebrate the recovery of his son Prince Asdang Dejavudh. White sand beach beside The Atsadang Bridge. The bridge extends into the palace grounds. 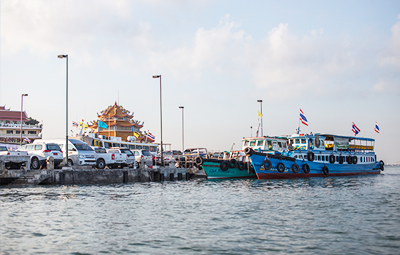 The bridge was used as a wharf for King Rama V on his return from his visit to France. A picturesque public park featuring an elevated promenade and several pavilions. 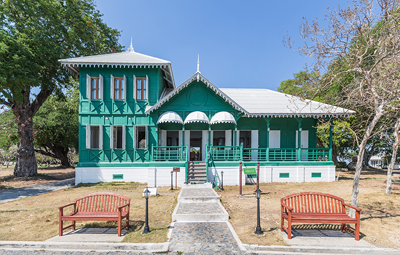 The park offers amazing views of the island’s striking topography and is a ideal spot to watch the sun set. Rent a bicycle at one of many rental shops on the island and ride around the island. One can ride around the whole island at a leisurely pace in less than half a day. 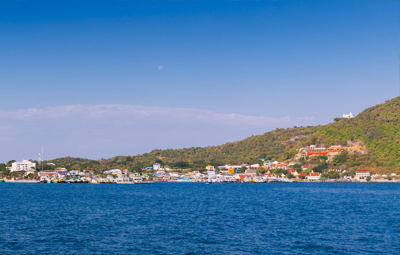 One can ride around the whole island at a leisurely pace in less than half a day. 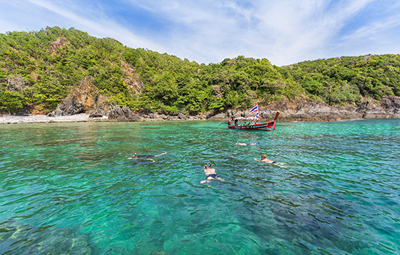 Book a trip to go snorkelling in the waters around Koh Khang Khao. 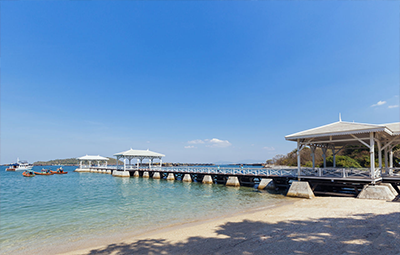 Activities on the island: The island has a long beach walk or a paddle through the shallows; snorkel or dive at the coral reef. 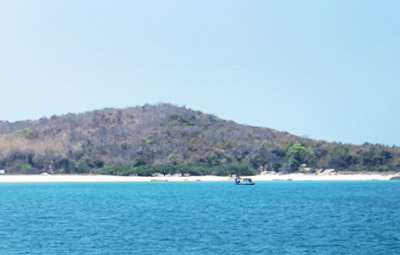 There is no public boat available from Koh Sichang but you can hire a speed-boat for your trips. 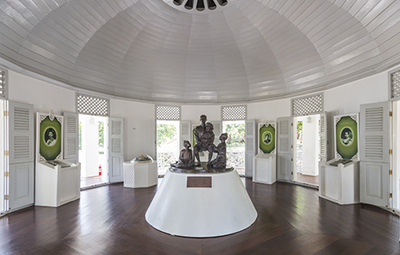 The island is under the protection of the Navy. The trip takes about one hour from the shrine. 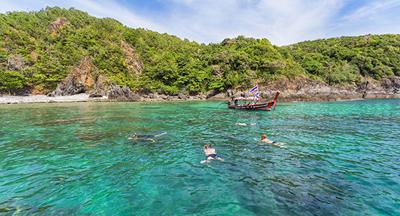 Some tourists rent speedboats or yachts boats to moor near the beach in order to snorkel and swim in private. 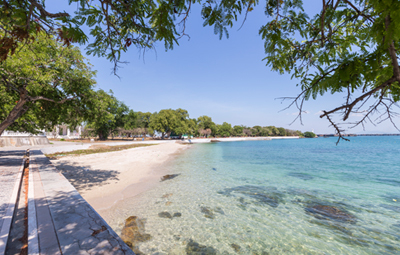 Bamboo Island beach is a white-sand with crystal clear waters. 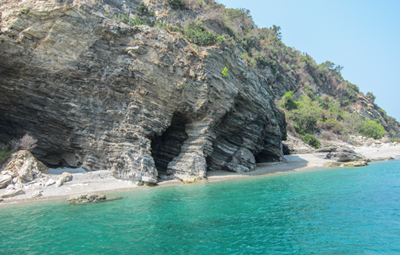 Most beaches around the island are dotted with many jagged rocks scattered underwater. But with the peaceful atmosphere, and the clear blue water’s green irridescence, it attracts many tourists.